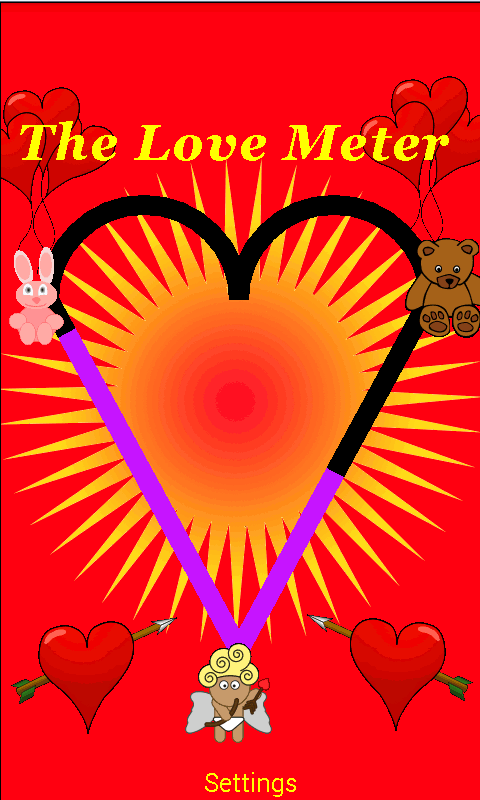 Its hard to put a figure on how much two people love each other, but we do it anyway with our fun love tester app. Watch the levels bounce up and down between 0% and 100%, will your love measure up ? Place a finger on one of the buttons at the bottom of the screen, get your boyfriend, girlfriend to touch the other button then watch as the love meter gets to work. It doesn't analyse heart rates, body temperature or electrostatic response but comes up with a percentage match anyway. It also tells you whether you are a hot couple and should buy a house together, or if you should just remain friends. It was designed as a two player game, but can be played by a single player. In single player mode, simply picture your loved one in your head (Johnny Depp, or Angelina Jolie, etc) press both buttons and let our match maker do its thing. Unfortunately we can't set you up with a date afterwards, this is not a dating app.